Clinton said she did not want to “prejudge the Israeli position until we’ve had face-to-face talks.” But she then cautioned that Israel was unlikely to gain support for thwarting Iran unless there were visible efforts to achieve Palestinian statehood. “For Israel to get the kind of strong support it’s looking for vis-a-vis Iran it can’t stay on the sideline with respect to the Palestinian [sic] and the peace efforts, that they go hand-in-hand,” Clinton said. Now we know that Sunni Arab states like Saudi Arabia, Jordan and Egypt are very concerned with Iran’s attempt to expand its sphere of influence — both political and religious — to include the entire region. Through Hezbollah, which has been called the “Foreign Legion of the Iranian revolution”, Iran has established control over Lebanon, attempted to subvert Egypt and of course terrorized Israel’s northern frontier. Iran has armed Syria with a formidable missile force and supports the most radical Palestinian elements — Hamas, Islamic Jihad and radical elements of Fatah with money, arms and training. It is likely that after the US leaves Iraq, this country too, with its Shiite majority, will almost certainly fall under Iranian influence or control. All this so far has been accomplished by an Iran with a relatively weak conventional military. If it obtains nuclear weapons, they will be used for blackmail and as an umbrella for Hezbollah, making Iran by far the dominant power in the Muslim Middle East. One would think that the last thing that the Arab states would worry about today is the tiny Palestinian territories. Especially since Palestinians are treated like subhumans in Lebanon, Kuwait, Iraq, Syria, etc. Of course this is correct: they don’t care a fig for the Palestinians, and they are worried about Iran. But they see an opportunity to apply pressure on Israel via the US, and the Obama administration seems ready to oblige them. In fact the chain of causality acts in the opposite direction to Clinton’s suggestion: the Iranian problem does not depend on the Israeli-Palestinian conflict; rather, the reverse is true. Efforts to reach a deal between Israel and the Palestinian Authority (PA) that would lead to a peaceful Palestinian state alongside Israel have so far failed to bear fruit, primarily because the PA has not deviated from its hardline positions: Israel must fully withdraw to pre-1967 borders including East Jerusalem and the Temple Mount, Israel will not be recognized as a Jewish state, and there must be a right of return for Palestinian ‘refugees’. Israeli-suggested compromises involving land swaps that would allow some settlements close to the Green Line to remain while the PA would be compensated with land from Israel proper, or arrangements that would permit partial Israeli sovereignty over the Temple Mount have been rejected. 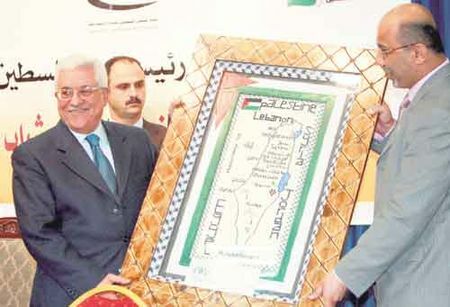 But [PA President Mahmoud] Abbas said that unless Israel halts expansion of settlements, “it would be futile to dream of the peace that we all hope for. Because if we fail, if we do not attain peace, then the alternative poses a serious threat. “Expansion of settlements” is a red herring, referring to Israel’s building houses within existing settlements — most of them either in neighborhoods of East Jerusalem or right next to the Green Line. We now know that progress in the Annapolis talks was really stymied by the PA’s refusal to compromise. Nevertheless, they never failed to raise the spectre of a renewed intifada if they did not get their way. And don’t forget that the biggest obstacle to a peace agreement is that almost half of the Palestinian territories are controlled by Hamas — Iranian-supported Hamas — which will not agree to end the conflict on any terms, even unreasonable ones. What is the biggest problem for the Palestinians. It’s not Israel. It’s their internal Palestinian problem. We saw so many atrocities. There is such danger within – between Hamas and Fatah. Their biggest problem is first of all Hamas. Hamas in Judea and Samaria, Hamas in Gaza – supported by the Iranians. It’s impossible to resolve any problem in our region without resolving the Iranian problem. This relates to Lebanon, to their influence in Syria, their deep involvement within Egypt, in the Gaza Strip, in Iraq. If the international community wants to resolve its Middle East problems, it’s impossible because the biggest obstacle to this solution is the Iranians. Think about it, Mrs. Clinton: are you putting the cart before the horse? The administration is looking for a way to keep aid flowing if the Palestinians form a government that includes elements of Hamas, the militant anti-Israel group that controls Gaza. Obama wants to alter language in the fiscal 2009 catchall spending law (PL 111-8) that makes the State Department worry about the possibility of a cutoff of aid to the Palestinian government should Hamas join the more moderate [sic] Fatah party in a power-sharing arrangement. The administration said it is focused on ensuring that a Palestinian government meets internationally accepted conditions regarding Israel. “This legislation is consistent with our policy,” said Benjamin Chang, a spokesman for the National Security Council. “It would prohibit assistance to a government that does not accept the Quartet principles but would preserve the president’s flexibility to provide such assistance if that government were to accept and comply with the Quartet principles,” he said, referring to requirements that a Palestinian government accept Israel’s right to exist, renounce violence and abide by prior Israeli-Palestinian agreements. In other words, Hamas can participate in a Palestinian government which receives US aid as long as the official policy of that government meets the “Quartet principles” — even though Hamas rejects them. Of course, it is not clear if Hamas would participate in a government which did agree to them, but you can bet that efforts will be made to find a magic formula to make the problem go away. Rep. Mark Kirk (R-Ill) likened this to supporting a government that had “only a few Nazis in it”. There is no Palestinian state or economy; they are totally dependent on international aid (mostly originating in the US). This is because their leadership (Fatah and Hamas) and their allies in the Mideast have always chosen war over acceptance of Israel. Many Palestinians living in Hamas-controlled Gaza allegedly ‘work’ for the Palestinian Authority [PA], so they get salaries from the PA, funded by the US and paid via Israel. Others have refugee status, so they receive aid from the UN. Hamas also gets direct aid in the form of money and munitions from Iran. All its resources are used to make war on Israel. When Israel struck back, the US agreed to pay to rebuild the damage in Gaza! But nobody can figure out how to do this without aiding Hamas. Meanwhile, there’s a world-wide clamor to legitimize Hamas — despite the fact that it’s hard to find a more antisemitic and violent bunch anywhere. Maybe the problem is that the Obama administration is looking at things from the wrong angle. Maybe the absolute top priority in the Mideast today should not be establishing a Palestinian state? Maybe acting to stop the destabilizing activities of Iran — its sponsorship of Hezbollah in attacking Israel, destabilizing Lebanon and even Egypt, its support of Hamas, its attempt to control half the world’s oil supply by nuclear blackmail — is more important than establishing yet another Arab state ruled by racist thugs like those of Hamas and Fatah? Barry Rubin and Jonathan Speyer on The Anglo-American pro-Hamas lobby (yes, there is one. Hizballah, too). Incidentally, Barry Rubin’s new blog is excellent, and should be on everyone’s list to read regularly. Ralph Peters on 21st Century diplomacy and War, the complete article by Peters with comments by Richard Landes on Landes’ blog. Peters explains how and why the ostensibly greatest military power the world has ever known has apparently forgotten the most basic truths about warfare. DEBKAfile’s Iranian and intelligence sources disclose that Moscow warned Tehran Friday April 17 that Israel was planning to destroy all 140 fighter-bombers concentrated at the Mehr-Abad Air Force base for an air show over Tehran on Iran’s Army Day the following day. The entire fleet was accordingly removed to remote bases and the display canceled. In the first week of April, Tehran announced it would stage its biggest air show ever to dramatize a ceremonial military parade in the capital on April 18. Iran would show the world that it is capable of fighting off an Israeli attack on its nuclear facilities. Instead only four aircraft flew over the saluting stand. Iranian media explained that the big show was canceled due to “bad weather and poor visibility,” when in fact Tehran basked in warm and sunny weather. 1) The logistics of an air attack on the Iranian nuclear facilities are complex enough that it’s doubtful that any aircraft would be diverted to a secondary target. The poorly-maintained Iranian air force would not be a threat to the strike force, so why attack it? Syrian and Hezbollah missiles aimed at Israel pose a greater danger. 2) While Israel will likely attack Iran when there is no alternative to prevent Iran from obtaining deliverable nuclear weapons, nobody thinks that this point has been reached yet. DEBKA’s sensational fantasies do not do anything for their credibility. The following picture is making the rounds in Israel. It supposedly shows a Palestinian truck modified for use as a mobile Qassam launcher. If anyone knows whether this is for real or a product of Photoshop, please let me know. The top caption reads “note from where they are launching the Qassams and mortars”. 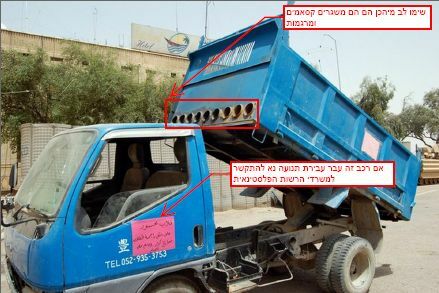 The bottom one translates the Arabic sign on the cab: “if this vehicle violates traffic laws, please contact the Palestinian Authority”. Indeed. The Muslim Student Union [MSU] at the University of California, Irvine — one of the most militant anti-Zionist groups on the US campus scene — is staging a massive multi-week anti-Israel event, including appearances by notorious Israel-haters such as George Galloway, Cynthia McKinney, Anna Baltzer, Amir Abdel Malik Ali, and the inimitable Gideon Levy of Ha’aretz. I could write a book about every one of them, but suffice to say — absolutely without exaggeration — the leadership of Hamas is no more fervently devoted to the destruction of the Jewish state than any of the above. And the same goes for the MSU, which explicitly supports Hamas. The event is called called “Israel: the Politics of Genocide”, which is actually quite accurate if you think about the goals of the terror organizations supported by the MSU. If you are a member of Facebook, you can see the MSU’s announcement here. OK, I understand the Society of Arab Students and the Pakistani Student Association, but the Hip Hop Congress? The Hindu Student Council? I’m particularly unhappy to see the Armenians there. As Christian victims of a Muslim genocide like the one Hamas and the MSU would perpetrate in Israel if they could, they should understand that they are on the wrong side (consider Hamas’ treatment of Christians in Gaza). Yes, they are understandably annoyed by Israel’s failure to call for Turkey to admit that the events of 1915 were in fact genocide. But it would be better for them to concentrate their efforts on the US — or the EU, which Turkey wants to join — than on a tiny country whose foreign policy is dictated by considerations of survival. Still not convinced that Iran must be prevented — by any means necessary — from becoming a nuclear power? Words are not an adequate response to the gutter trash that is Ahmadinejad and his cohorts. And Ahmadinejad is not the only one. The same sewer rhetoric — or worse — can be heard in the mouths of Palestinians of both the Hamas and Fatah varieties, and even from ‘progressive’ activists here in California. Ahmadinejad has done us a favor by showing the world that antisemitism is real, Jews are not ‘obsessed with the Holocaust’, and it’s not just ‘Jewish paranoia’. They do hate us and want to wipe us out. The Zionist idea that a Jewish state can prevent another Holocaust is about to be tested as severely as it has ever been since the end of WWII. Another Zionist idea, whose truth was firmly established then, is that the Jewish people needs to defend itself — nobody, not the US, not any other nation or international organization, will do it for them. I’m confident that Israel will defend herself and the Jewish people yet again, and Ahmadinejad’s place in history will be assured — not as the destroyer of Israel he aspires to be, but rather as one who brought catastrophe onto his own people.